At the end of a long growing season, you may be tempted to lock up your greenhouse and postpone any final cleanup tasks until next year. While the urge is understandable, giving into it is not a good idea. Waiting to clean your greenhouse will essentially turn it into a hotel for pests and diseases, many of which can survive for months in the harshest of conditions—contrary to popular belief, cold weather won’t freeze them out. Investing a few hours now will eliminate a lot of stress and save you money in the long run on chemicals and work hours, while laying the groundwork for a top quality crop next year. To make your fall cleanup easier, we’ve put together a list of nine tasks you can do to minimize disease carryover and get your greenhouse ship-shape for next season. Task #1. Treat leftover crops. Treat any crops left over from the last harvest before removing them from the greenhouse. Though this may seem like a waste of chemicals, it makes sense to destroy as many pathogens as possible before unwittingly transferring them to another location outside the greenhouse, where they can hunker down and infiltrate next year’s crop. For this purpose, it’s best to use a fogger, which will attack pests not only on plants, but those feeding on weeds or other organic material as well. When treating, maintain a greenhouse temperature of at least 75 degrees F. Pests are more active when it’s warm, and most chemicals work better and faster at warmer temperatures. Task #2. Empty the greenhouse. Remove all used growing media, plants, and weeds in closed containers or bags to eliminate the possibility of spreading disease. Using a broom and/or a vacuum, clean the greenhouse from top to bottom to remove all dirt and debris. Don’t forget to clean rafters, window ledges, behind furnaces and other mechanical equipment, as well as beneath benches and work tables. Dispose of all organic material promptly in covered bins or bury it deeply in the ground away from your greenhouse. Since pests love weeds, mow a wide swath around the perimeter of the greenhouse and use an appropriate herbicide if necessary to help keep weeds to a minimum. Task #3. Kill pests with heat. Once you’ve removed all organic material and dirt, close all vents and allow the greenhouse to heat up to approximately 75 degrees F for several days. The warmer temperature increases the metabolic activity of pests, who will then essentially starve to death in the absence of a food source. Task #4. Wash all surfaces. Use a detergent to wash all surfaces of the greenhouse, including floors, walls, benches, and potting tables as well as any tools and equipment or containers you plan to reuse. (If you had a problem with root rot, however, it’s best to discard those containers.) Pay particular attention to porous or textured surfaces, such as concrete or bare wood benches, as dirt can become lodged in the crevices, creating a food source for pathogens. We recommend using a high-pressure washer to ensure complete removal of dirt and organic material. Rinse well. NOTE: It’s imperative to wash all surfaces before applying disinfectant because any debris left behind will shield pathogens from the disinfectant. Task #5. Disinfect the greenhouse. 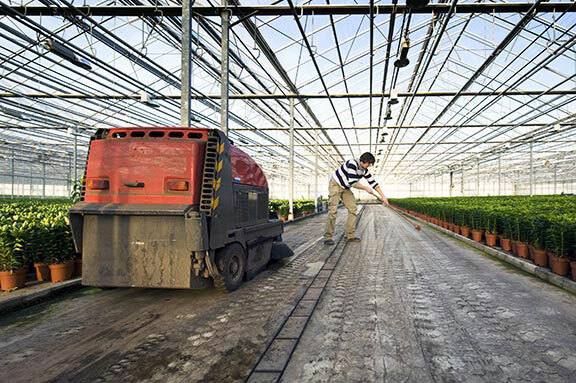 After all surfaces have been cleaned and rinsed, use a high-quality disinfectant made for greenhouse-use. As with Task #1, maintain a greenhouse temperature of at least 75 degrees F as most solutions work the most efficiently in warm temperatures. Sanitize all surfaces as well as any cleaned pots, trays, and flats that you wish to re-use. X3® from Phyton Corporation is a buffered formula containing three actives, hydrogen peroxide, peroxyacectic acid, and octanoic acid. It kills bacteria, fungus, and algae and is labeled safe for use on plant material. It has a zero-hour REI and poses a low risk of phytotoxicity when used as directed. See “Phyton Quick Tips” for rates, and always use products according to labeled instructions. 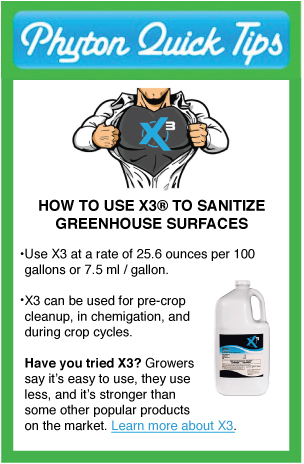 X3® is highly concentrated for greater efficacy and lower cost in use. The “triple-powered” formula has much lower levels of hydrogen peroxide than competing sanitizing products. Task #6. Clean irrigation lines. Clean and flush your irrigation lines to remove any build-up of algae, bacteria, or precipitates. Follow manufacturer instructions. Task #7. Make repairs and perform routine maintenance. Check the condition of your equipment, make repairs, and order any parts that need to be replaced. Repair any low spots in the floor that do not drain well (standing water invites algae and other pathogens), replace or repair clogged spray nozzles, replace worn fan belts, and make any necessary repairs to glazing, doorway seals, etc. Replace any worn weed mat or plastic sheeting to control weeds. This is also a good time to consider improvements, such as upgrading bare wood benches to those made with laminate or expanded metal that do not harbor pests and are easy to clean and sanitize. Task #8. Take inventory. Organize and take inventory of your chemicals, making note of expiration dates, product condition, and your resistance-management rotation schedule. Make sure all products are labeled and locate their SDS/MSDS. Contact the manufacturer for new copies of labels or SDS/MSDS that have been damaged or you can’t locate, and place them in a prominent, easily accessible location. Perform a thorough inspection of all PPE to make sure it is in good working condition and has adequate remaining service life. Dispose of any damaged or worn PPE and order new equipment if needed. Task #9. Create a Sanitation Protocol. If you haven’t done so already, create a sanitation protocol your employees can learn and follow in the upcoming season. If you have a sanitation protocol already, review it and make any necessary changes to improve employee adherence and understanding. Your greenhouse will remain healthier if all employees understand and consistently implement sound cultural practices. End-of-season cleanup is your first line of defense against the carryover of harmful and costly diseases and disease sources to next year’s crop. By finishing clean and organized, and by making a rigorous integrated pest management program a priority, you will have an easier time staying clean throughout your next crop cycle, leading to better plants, more satisfaction, and a better bottom line. “End of Season Cleanup,” Alberta Agriculture and Forestry. http://www1.agric.gov.ab.ca/$department/deptdocs.nsf/all/opp4524. “End of Season Cleanup,” Alberta Agriculture and Forestry. Ruth Benner, “Spotlight: Starting the Season Clean,” Penn State College of Agricultural Sciences, Penn State Extension, http://extension.psu.edu/plants/green-industry/news/2012/starting-the-season-clean.